Big cats at large in the Lancashire Dales? Maybe not, but Bank House Fishery has its own stripy predator, the tiger trout. NICK HALSTEAD shows us the flies and methods he uses to catch one. The small Minkie, imitating a nervous stickleback, twitches and jerks its way around the jungle of weeds and branches. It’s there, like the staked goat, to attract one of the more spectacular-looking predators in the stillwater trout fishery . . . the tiger trout. A hybrid cross between an American brook trout and our native brown trout, the tiger is a handsome quarry with the characteristics of both species, particularly the aggression of the brownie. With the parent American brookies no longer so easily available, tiger trout are becoming increasingly unusual at our fisheries. Bank House, on the edge of the Lancashire Dales at Caton, is now in its 31st year as a trout fishery. The lodge was once part of a cotton mill powered by a water wheel before it silted up through neglect. Jan and David Dobson bought the property and set about turning it into the eye-catching fishery you see today. Dredging, tree planting and thoughtful landscaping by retired vet David have now created a haven for the local bird and wildlife. A kingfisher is seen most days. I’m there with Nick Halstead who has set his sights on catching a tiger trout as part of his own Bank House McNab— four different species of trout in a day. A traditional Highland McNab is now recognised as a brace of grouse, a salmon and a stag. As well as the prized tiger trout, the fishery is also stocked with rainbows, blues and browns. And there’s a population of wild brown trout that move down from the beck that feeds the lake. IT’S one of those glorious Indian summer days and the tree-lined picturesque two and a half acre lake is busy with anglers. The local River Ribble has a run of autumn salmon, and when the river is in spate, Bank House is popular as a stillwater option. Most are there to enjoy the day, for whatever species comes along. But Nick is deliberately targeting the tiger trout with his mini Minkie. Nick pushes his landing net into the margins to see what type of food is available. And comes up with a netful of creepy-crawlies, including water snails, alder nymphs, lots of corixa and a silver shower of tiny sticklebacks. We can see lots of swirls and splashes close to the numerous islands. On his last visit, Nick found that his own tying of the Minkie as a stickleback imitation sorted out the tiger trout. Using a long leader with two heavy Buzzers and a small Minkie on the point fished on a floating line was the key to tiger success. Nick lends me one of his “tigerbait” chain-bead eyes Minkies with the plea “don’t lose it.” Mature trees with fly-grabbing branches surround Bank House. Owner’s son and Stocks boss Ben Dobson goes round daily with a long-handled pruner to recover stranded flies. A number of fish are moving off the picturesque lodge. I make a long cast towards the disturbances and let the Minkie sink slowly through the water. This is one of the deeper parts of the lake. Halfway back through the retrieve, the line tightens and an orange stripy flank breaks the surface. I have hooked my first tiger trout. Tigers fight tenaciously, boring down again and again. But when the three-pounder is in the net, the hook comes free. It’s a truly spectacular-looking capture with white trailing edges to the lower fins, displaying its char heritage, and those mottled stripes on the flanks and sides which give the trout its name. Catch and release is allowed, so I slip the tiger back to resume its hunting around the weed beds. Moving further down the bank, I cast the Minkie close to what looks like an obvious ambush point. Almost sensing that a fish is following, I concentrate on the leader end to see it stab down in the water. Remembering Nick’s advice, I keep retrieving as the rod tip bends round into another tiger. The water at Bank House has a peaty colour today after some recent rain, but those golden-brown stripes are unmistakeable as the fish boils in a welter of spray. Then, just when the fish is ready for the net, it comes adrift. As the morning clouds clear away to bathe the fishery in glorious sunshine, I put down the rod and take the opportunity to walk the banks with Stocks boss and fish farmer Ben Dobson to learn a lot more about tiger trout. Bought in as fingerlings, the tigers grow quicker than browns and are stocked at around two and a half years old. The females are not fertile and the males produce no milt, but they are very aggressive and fight on the fish farm. Nick Halstead’s infectious laughter and fish-catching skills make him a natural attraction for other anglers. He’s never happier than when he’s teaching other beginners how to catch fish. Carefully working his way from platform to platform, pushing the Minkie as close to the overhanging trees and bushes as he dares, Nick extracts everything he can from each swim. His competition-fishing instincts dominate as he moves into doubles-figures in numbers of fish caught. Some of the most popular pegs at Bank House are revealed by the number of lost flies in the surrounding bankside trees. Approximately, 15 to 20 per cent of the stocking into Bank House is tiger trout, with the remainder made up of mainly rainbows, blues and quality browns. The tigers run to about 9lb, although Ben wants to grow on some larger fish for stocking. Blue trout into doublefigures are common. Nick’s firstever rainbow from Bank House still stands as his largest weighing in at 20lb 8oz. At the far end of the lake is a shallow area where a small beck enters. Attracted by the flow of fresh water and numerous sticklebacks, some rather large trout can be seen finning across the current. Here Nick rigs up an indicator set-up and flicks a small leaded white bug among the cruising fish. This helps to keep the fly down below the numerous floating leaves that can be such a hazard in autumn and early winter. By dropping the fly in front of the cruising tiger’s noses, Nick is able to induce a take or two. But the hoped for wild brown doesn’t materialise. WITH tiger trout firmly ticked off the McNab list, there are still three species to go. Rainbow trout are moving all across the lake, yet the Buzzers on the droppers are not working. Nick puts this down to the fact that the fish are very high in the water and his heavyish patterns on fluorocarbon are actually fishing below the cruising level of the fish Of course a trout cannot see what is below its level — hence the lack of takes on the nymphs. When Nick switches back to an all-black Minkie, tied with black Straggle Fritz for the body, he is quickly rewarded with a succession of rainbows, and a sleek shimmering 2lb 12oz blue trout which hammers his fly when figureof- eight retrieved just sub-surface. In the late afternoon, with the autumn sun dipping across the water, fish are rising everywhere. One local uses a small Black Beetle to tempt these finicky risers. Nick tries a tiny Black Shipman’s Buzzer in the surface but it’s rainbows only that take the dry rather than the hoped-for wild brownie. Nick is a man to try as many methods as possible. Another option when fish are moving so close to the top is to fish a bright orange Egg Fly or small Blob a few inches below an indicator. This method may seem crude but freshly stocked fish just cannot refuse it. The McNab still seems elusive until Nick’s all-black mini Minkie is taken by a fin-perfect 2lb 8oz brownie to create a satisfying end to a perfect day. BANK House has a sensible rule about hook and flies that suggest they should be international size hook length — no greater than 5⁄8th inch and an overall fly length of 15⁄16th inch. Says Nick: “I searched my boxes and found a number of small Minkies which fitted the bill perfectly. The fly is tied with a strip of mink fur (although numerous other furs such as rabbit, weasel and my particular favourite chinchilla also work) along the back. “One of the major trigger points of any bait fish pattern is the eyes and my Minkies have enamelled orange and chartreuse chain-bead eyes which stand out well in the slightly peat-stained water. “I had various colours of minkie tied with bodies that varied from dubbed Hare’s Ear to a Sparkler Fritz type of material, so I initially decided to experiment with the various Minkie patterns to see if I could tempt a tiger. SAYS Nick: “Cast the fly into the margins and observe carefully the way the fly is moving. Speed of retrieve is crucial. If you strip the fly back really quickly, then the action of the mink strip will be lost and the fly will lose a lot of its appeal. “Try flicking it into the water at your feet and note the speed of movement when the tail of the fly starts to kick. This is the optimum speed of retrieve for maximising the effectiveness of this fly. Always check that the tail of your Minkie is not wrapped around the point of the hook (left). Check the speed of retrieve is giving the fly the right amount of kick (right). If it's retrieved too fast, the fly loses its appeal. NICK initially tackled up at Bank House with a fluorocarbon tippet using quite stiff material (0.21mm diameter, 8lb breaking strain). But after 15 minutes concluded that the fly wasn’t “swimming” correctly. 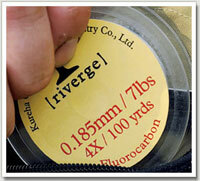 Says Nick: “I put this down to the stiffness and diameter of the fluorocarbon. “So I changed the tippet to a softer, more supple brand of a lower diameter (0.185mm, 7lb) and my catch rate improved significantly. NICK describes Bank House as an “intimate” water. “The wellplanned peg positions ensure that anglers never feel crowded, and there are numerous small islands and features which provide a haven for the food sources and so have a magnetic attraction for the trout. “By continually moving and casting into fresh water, you will improve your chances of catching. Fish will always move away or become wary of the more heavily fished stretches. “The more successful anglers at Bank House, and many similar fisheries, are the ones who can cast into the awkward lies. At many fisheries this just means casting a little further than the next angler. For example at Bank House distance casting is not required, but you need to be accurate. “Before you start fishing, try to envisage where the least amount of casting activity has taken place. This untouched water is the most likely to produce fish. “This is a good excuse to practise the roll cast for instance when the back cast is hindered by foliage. I found myself really trying to thread the fly through the overhanging vegetation so the fly could fish down the side of one of the islands or under an overhanging bush. When I got it right, I was rewarded with a pull, many of which turned into quality trout. “However, we all got it wrong on numerous occasions and my stock of mini Minkies was severely depleted by the end of the day. The more difficult cast up against the island trees will yield more fish than a cast into open water, which is usually well fished. Tiger trout like to hang close to roots and branches from which to launch their attacks.